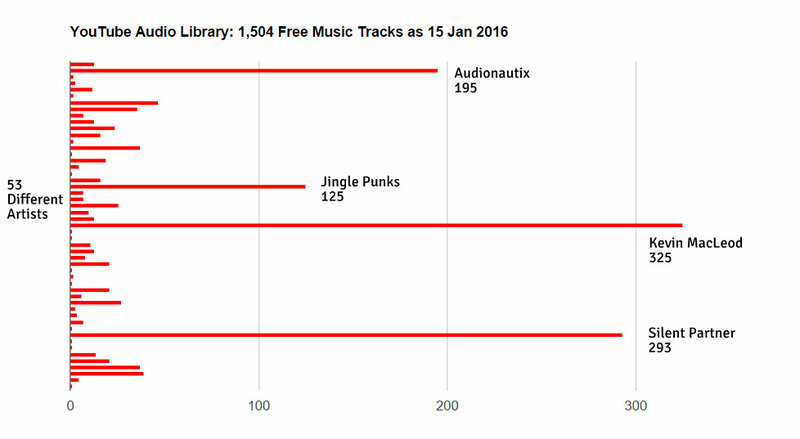 Here's the Jan 2016 Survey of the YouTube Audio Library Free Music Tracks. 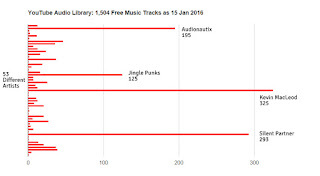 There are now over 1,500 tracks from 53 different artists. You can have a play around with this data sheet, but please take a copy first. If you are new to using the Library, then read this help page. This is very important as there are copyright rules and attribution guidelines you must follow - if you do not then this may impact your youtube channel. and insert as a separate audio track. After downloading a track, you can open in Audacity to check a visual waveform. As you see on the right, this track breaks half way through. It's helpful to plan ahead - I often use the ending of a track. You may also need to duplicate a track, to match it to the correct length of your video. You then face in/out and match the beat and with luck it works perfectly. There are also over 1,700 Sound Effects to choose from too. I've purposefully not included my favourite tracks as it's so subjective - what I will say, look for the lesser known tracks and settle on an artist that you like, then explore all their work. Good Luck..